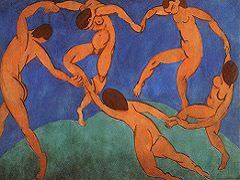 Modern artists were trying to find new ways of looking at the world, moving away from depicting images in traditional three dimensions, discovering livelier and simpler - yet also more complex - ways to convey those images. 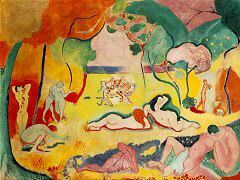 By the end of the 19th century, we see Matisse experimenting with dimension, a kind of flattening process in which the images become less literal and more symbolic. 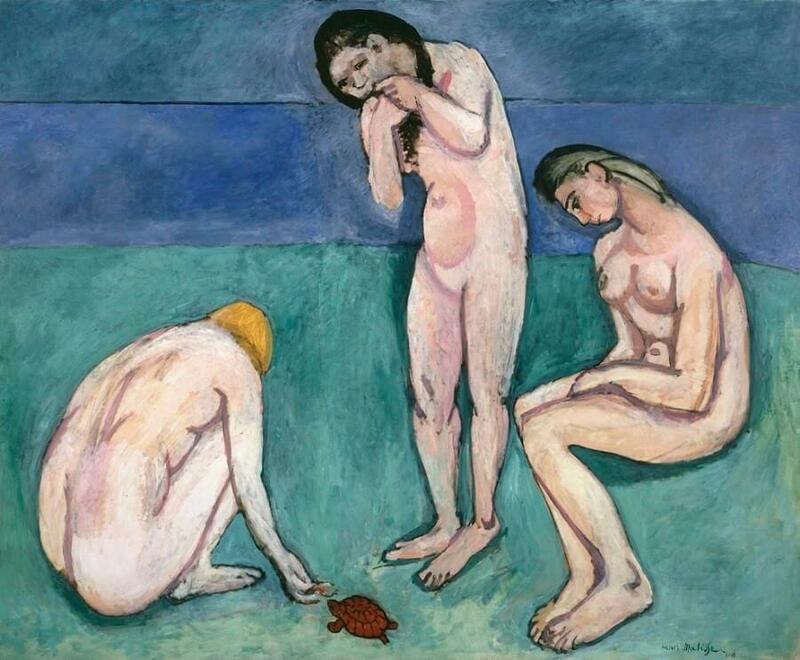 One of his strangest and most original paintings, Bathers with Turtle, is from 1908, barely a year after the tradition-shattering Demoiselles d'Avignon of Pablo Picasso, in which the bodies of five women have been transformed from rounded human beings into fractured and contorted figures with African masks for faces. 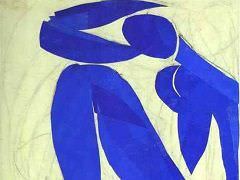 Matisse's figures are even more mysterious: three simplified nudes, almost like a child's drawing. He offers no explanation for why they're feeding a turtle, or why one of them has her fingers stuffed into her mouth. How can we tell if this is a casual incident or a profound ritual? Does it matter? Horizontal bands of blue abstractly represent a backdrop of water and sky. 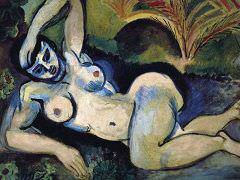 It's like Paul Cezanne, but more radical. Modern art is just beginning. 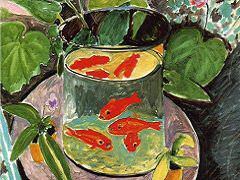 Throughout the early stage of his career, we see Matisse wrestling with the same issues his most celebrated contemporaries were confronting. 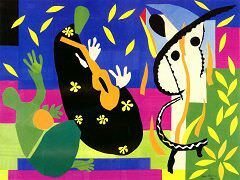 But Matisse seems to be moving backward and sideways as well as forward. 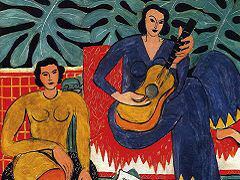 And through new X-ray technology, we have been able to trace Matisse's own processes. 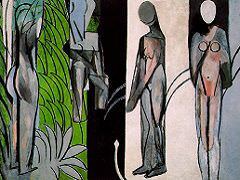 We now know when he's deliberately muting his dazzling spectrum of colors, or changing the position of his figures. 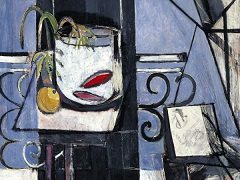 And in many places, instead of hiding some of his changes, he actually allows us to observe them - as if the figures themselves have been moving around the surface of the canvases.